Who is the invisible conductor that makes our heart beat? How did the ten thousand heart cells agree to a rhythm? From the simple beat of our hearts to complex symphonies of sound we hear from an orchestra, why does music help us think? How can an acoustic pattern help us to learn and grow? My husband says that music stops him from getting tunnel vision because as each new tune or melody starts, his creative perspective is redefined. Do you remember learning things from songs? For those of us of a certain age and living in North America, we had the joys of School House Rock to teach us everything from how legislation works (I’m Just a Bill) to how adverbs work (Lolly, Lolly, Lolly, Get Your Adverbs Here). I still hum some of these songs to myself when I need to remember the rules of grammar. We love patterns. The natural world is full of patterns, from the shape of shells to the patterns we see on leaves. We establish patterns in our body and with our body and we are drawn to patterns in our social lives. Have you ever watched the pattern of traffic? We all slow down and speed up for real or imagined reasons together. We will walk in step in a crowd. We comment on it in birds but we also like to flock. Rhythms are sound patterns, they are an audio pattern that we can connect to at a deep level and we not only relate we can relay that pattern. Go listen to Steve Reich. Music stimulates multiple parts of the brain, bringing them online while we listen. If you start singing, even more, pieces come onboard. Our connection to music and its ability to create new neurological patterns may help us to think deeper. Scientists have been looking at music to see if it could help adults with Alzheimer’s disease. The question they are asking is essential, can we rewire the brain to work around the areas affected by the disease by using music? Yet, as much as I adore music while I work, I have friends and colleagues who have said they want no music at all while they work. I can appreciate that people need different things, but for me, more often than not silence seems to mock me, creating diminishing echoes that go nowhere instead of ever evolving patterns of thought. When we work together, how can we find a happy medium? The folks at Focusatwill.com say they have done just that. At Focusatwill.com all of the music you hear has been re-mastered to be heard without you actually listening to it. Huh?? It’s essentially combining the benefits we get from listening to music but getting rid of the distracting bits that make others want to turn the music off. These are the sounds, like the human voice, that prompt our brains to pay closer attention, therefore distracting us from our work. I’ll be honest, I’m not convinced that’s it’s always the way I want to go, sometimes I need to sing along, particularly if the task is a tedious one, but I found the music soothing. I used it while writing part of this post and it’s an interesting approach. I think their solution might be particularly useful if you work somewhere where you can’t block out your colleagues with headphones but music is a menace for some of your co-workers. What do you think? Is silence golden or where words fail does music speak? If you’d like to find some alternatives to Focus At will, check out Rainy Mood, Jazz and Rain or Relaxing Beats. It helps get the creative juices flowing, and has been proven to be beneficial in healing, aiding with creativity, and expanding your mind. And yet, I don’t listen to music every day. Hmm. Maybe I should. I used to! When I go to get acupuncture as I am in the room there is music playing.. I am usually one who likes to sing along and then I lose my concentration. I found that the music of which I have never heard before with sounds of water, birds singing are actually relaxing which helps me to devoid my mind of thoughts. Sol I am totally relaxed when getting acupuncture. However, when working the music is distracting. Now if I play it before I start working it gets me in such a good mood I want to work. I have long loved music, both in airplay on the radio as a former radio personality, and as background to my creativity. There are a number of health benefits to great music as well, relaxation being one of them. I. Love. Music. Unfortunately, I can’t focus very well with music playing while I work. I need it to be really quiet when I work otherwise I can’t concentrate and music distracts me because I will sing along or get moved to remember something associated with a song. Music has many benefits, and it’s a shame so many schools are cutting it from their curriculum. 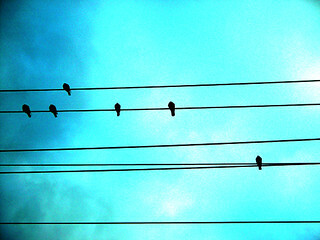 The picture you have of the birds on a wire above also has a video set to music based on their configuration. Have you seen it? I came across it a couple of weeks ago. Music is certainly “Mind Food” for me, as you say. I struggle to write or think when words are being spoke that I can understand. Living abroad is helpful because I don’t understand a lot of what’s being said around me sometimes. It’s good because I can just tune it out but lately, I’ve grown to understand more and that’s forced me to bring music to listen to in crowded places. Classical music helps me when working through a piece of writing or a book. Maybe I’m just getting old? On traffic patterns, I’m not sure about them in America (or Canada in your case) anymore but the ones found in Asia are amazing to see. I recently purchased a 50cc scooter and have reaped the benefits of the never-ending gap fills that occur during heavy traffic situations. It works almost like a beautifully orchestrated symphony. Thanks for sharing this. I really enjoyed the thoughts and as always, look forward to reading more. Love this post, Debra. I am one of those who cannot do mind work (my writing) with music playing. I find that music energizes me when I have to do physical work like cleaning the house or gardening. And other music will calm me if I want to go to sleep. But when I need my brain to be in top form, I need quiet and no distractions. Debbie I love this topic as I am a big fan of music both as audience and as participant. I once listened to research done about how shops use music to lure shoppers in to buy and it works, as people stay longer and actually buy depending on music they hear. I am checking out that site you gave, sounds interesting. I cannot study if I hear the slightest sound of music or sound. My most interesting issue with music is the fact that sometimes I sleep while its a full blast, then sometimes I cannot sleep while its soft, I need silence. This is one interesting area in human life. I have tried to work with music on. It doesn’t work. I ended singing the lyrics to the songs while I’m looking at a blank computer screen. I constantly have music on and it helps me be more think clearer, be more productive and a happier person. My husband on the other hand, will come and turn off the music if he needs to think. Different strokes as they say. Debra — I love music and playing the cornet when I was a youngster. I am forever grateful that I had the opportunity to play in my award-winning high school band and even march in the annual Macy’s Thanksgiving Day Parade in front of Santa Claus! Learning how to read music and playing within a “team” helped me to a greater appreciation of music when I listen to it at home or at a concert. However, I can’t listen to music when I’m working. It’s a distraction, although I have many friends who couldn’t work without the music on. Debra, I went to Focusatwill.com and tried it out because of what you said about not having to really listen to it. Maybe it’s because I used to play musical instruments — I automatically listened to all the different instruments playing Bach. I am definitely one of those who need absolute silence when doing serious writing. Music is certainly soul food. It can go where no words can and has the power to evoke a complex symphony of emotions.I use it to change my mood, especially when I am stuck! I hear you! Music can change my mood, mind and motivation when I’m writing. I love to listen to music, especially when I’m doing anything I don’t want to be doing, like cleaning the kitchen. You’re right that different projects call for different types of music. I like what you said about your husband’s creativity being sparked by the beginning of a new song. I think that applies to me too. I love your line: “How did the ten thousand heart cells agree to a rhythm?” Very poetic! I’m all about the music. I even go so far as to pick out playlists based on what I am working on. I have found, with the rise of Pandora like services it has become much easier for me to set and forget what I want to play. Not too long ago I found a site that plays various white noise type sounds. I enjoy the sound of thunder and rain while working on occasion. What I have discovered over my years of life (listen to me sounding like some wise old man) is I have a very active brain. If I don’t find something to occupy my mind while performing a task I can be easily distracted. Music helps to keep the the activity down. Of course they also provide a ton of other choices (from the Beatles to white noise) that let you press play and forget. Unfortunately for those of us in Canada (and outside of the U.S.), we can’t access Pandora. I found this one a bit ago (http://www.noisli (dot) com/#about). They do some of the great random noises and now they even have an IPad app. Sometimes when I want to here the rain and such when I fall asleep I will use them. I have to have silence when I work. Music distracts me and I’ve experimented with many different kinds. And, surprisingly, when I cycle, no music – I cycle outside and would rather hear nature than my blasting iPod. And, even more unbelievable, when I drive more times than not, I don’t like music on, but I DO sing in the shower. Go figure! Seems we are different in this respect, Debra. Personally never listen to music when I work. On and off listen to it first thing in the morning but at the moment am off that too. For me a quick nap or a walk works much better if I’m not connected to creativity, or productivity for that matter. I understand, I think it’s such a personal thing. As to walks, they do wonders for my brain too. I find some of my best solutions when I’m walking. Very interesting article, Debra. Music helps me cope with stress. If I need to relax, I listen to “New Age” type music, such as Peter Kater. If I feel like dancing. I listen to some Bee Gees or Al Green and If I want to think beautiful thoughts. I listen to romantic ballads, from Tony Bennett to Steve Perry. While working, I have jazz or classical playing in the background. I think music has a lot of power. I don’t usually have it on when I’m writing – it’s too distracting. But I find it easier to do work around the house with music in the background. When I was working in the corporate world, I found I could help reduce stress levels with headphones on and listening to favourite music when doing solo work at the computer. Housework with music makes the housework go so much faster. If I’m cleaning with my kids, my son and I can’t be on the same floor because then we have the music wars. 🙂 I also love cooking with music. Debra, my husband and I are at either end of the spectrum: he loves playing music, fast pace and loud. I prefer no music but will go for slower, no words and softly in the background. So bring on the headphones so we each can create our especially wonderful environment. Isn’t strange how music can impact us in such completely different ways? I have a friend who can’t stand music in restaurants because she finds it so distracting, yet she is an avid concert goer and loves live music. I’m very visually-oriented. I do art, design my garden, think about the colors of the food I serve. So if you substitute art where you talk about music, I’m there. I like silence while I work. Chirping birds are fine. I know that this will seem incongruent, but I am more of a “silence is golden” person. Yet I used to sing in a jazz trio! When I am working, music is more of a distraction for me. Probably because I stop writing and start singing! Ha! My parents were both teachers and from early on taught us study skills…silence was a part of that. The rule was no radio or record player. Yet my sister was a classical pianist and played all the time, so music was always wafting through our house. I think I will check out focusatwill…sounds like a happy medium.Very interesting post!